This picture shows the gas canisters that carry the isoflurane and form the bulk of the inspired (breathed in) gas. 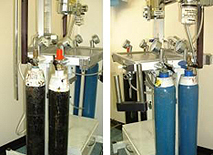 The black bottles contain oxygen, the blue ones nitrous oxide. Excluding the cost of delivery and cylinder rental, nitrous oxide costs us almost three times as much as oxygen. Most anaesthetics are safer when nitrous oxide is used than when not.